7:28 PM 7/15/2018 – Pattern Recognition Analysis in Counterintelligence: If the hackers “remotely configured an overseas computer to relay communications” in DNC hack, why wouldn’t they be able to do the same thing to Abedin’s Blackberry device?! M.N. : Mr. Rosenstein, please pay attention to this “matter”! M.N. : Abedin’s BlackBerry device was “intentionally configured” to back-up emails. She did not do it, and denies knowing how to do it. 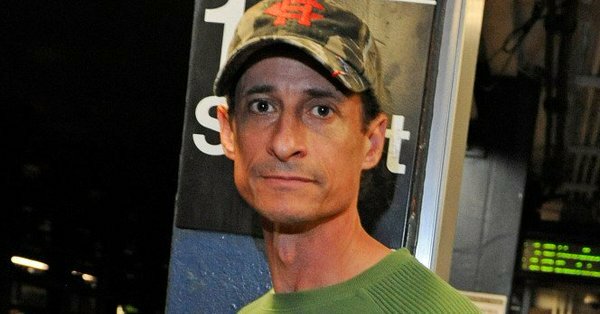 A. Weiner did not have any reasons to do it either. It is hypothetically quite possible that Abedin’s BlackBerry device was clandestinely configured by someone who had incidental access to it for a short period of time (1-5 minutes, it could cleaning or maintenance staff, etc. ), or remotely, wirelessly by air. Both options are very realistic possibilities. Was this hypothetical explanation properly investigated? Who might have obtained a brief access to Abedin’s device? Were the Weiner’s sexting sessions used to obtain the wireless access to change the controls or configurations on the computer and/or devices? Was this done by the same players who might have, hypothetically, arranged or set up these sexting sessions themselves? Was this possibility adequately investigated? How did Erik Prince know about the “upcoming Weiner’s arrest” and the NYPD investigation from the “very well placed source”, and how did Giuliani know about the “October Surprise”? What are theirs, and also James Kallstrom‘s and the NY Branch of the FBI sources of information and connections, including the hypothetical connections with the foreign Intelligence Services, including the German Intelligence Services? 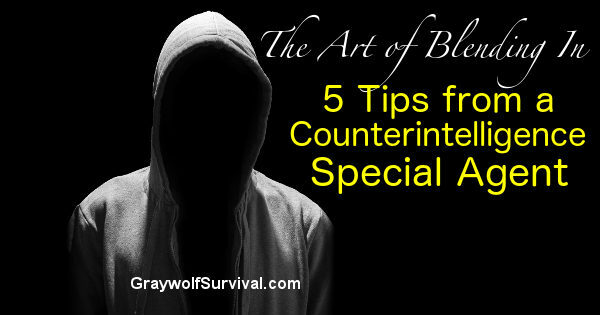 Germany is one of the few countries which has the sufficient cyber know-how to conduct these types of the operations, and more than sufficient experience in conducting sophisticated intelligence operations in general, and throughout the history. These are the legitimate questions to ask. “An examination by of emails released by the State Department shows that backup copies of many of Abedin’s work-related messages with Clinton were created in the dates after Clinton left the State Department in early 2013. The emails, released at the end of December, show that they had been put on Weiner’s laptop by a BlackBerry archiving program. Abedin had told FBI investigators that she did not have a method of preserving the emails she exchanged on a private server with Clinton. ‘Abedin stated that she lost most of her old emails as a result of the transition [from the State Department]. ‘She had only accessed <a href=”http://clintonemail.com” rel=”nofollow”>clintonemail.com</a> through a web portal and did not have a method for archiving her old emails prior to the transition,’ said notes taken during an FBI interview of Huma Abedin on April 5, 2016. Abedin gave a similar response when she was deposed under oath by attorneys from Judicial Watch on June 28, 2016. ‘With respect to those State Department work-related emails on the accounts, what did you do, if anything, to preserve those emails?’ asked an attorney with Judicial Watch, according to a transcript of the deposition. ‘The instances where it was Clintonemail to Clintonemail, there were instances where the content of those emails had personal matters in there, and there may have also been State Department matters in there, too. ‘It was a – a combination. But I did not – I did not preserve those e-mails,’ added Abedin. Abedin and other members of Clinton’s inner circle at the State Department used multiple email addresses – including one official State Department account, and another on Clinton’s private email server located at her home. Abedin testified that she left all of her emails from her Clinton server account in her inbox after leaving the State Department. She said she did not delete any emails. ‘I just left everything on what – on the system, I guess,’ she said during her deposition. The discovery of the existence of the Clinton server has led to a series of lawsuits by Judicial Watch. It was during one of those that Abedin was deposed under oath and it was due to another one that the State Department had to release the latest tranche of emails last Friday. Abedin has said she was not aware that her emails were on Weiner’s laptop and did not know how they ended up on his computer. She reportedly used the laptop occasionally to check her messages. Some of the emails found on Weiner’s laptop were forwarded to him directly from Abedin, their details show. But many of them ended up on the computer through the backups of Abedin’s BlackBerry on February 3, 2013 and February 7, 2013. She had left the State Department, like Clinton, on January 20. The messages were archived from ‘BBB Backup’ and ‘LoaderBackup’ from a BlackBerry Bold 9700. Abedin or someone working for her would have had to intentionally set up the backup program for her BlackBerry. ‘What you’re seeing here is a backup restore of what was sent from her phone,’ said Coro. ‘They set up a backup to be done when she plugged it in to her computer, to the laptop, or potentially over the air [remotely]. 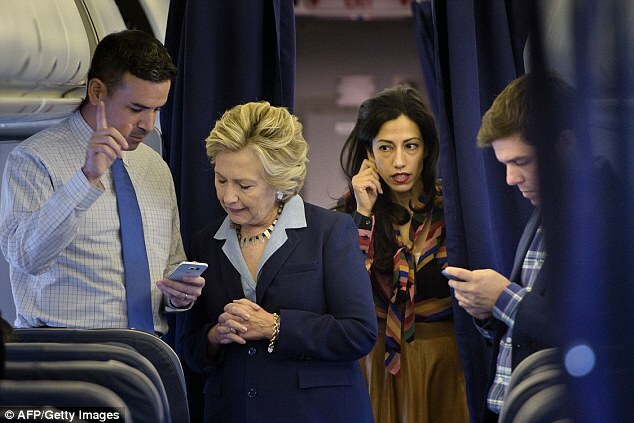 That means that either Abedin, or an assistant, consciously set up the backup system or that she confirmed that she wanted to backup when she was prompted to by her BlackBerry. Once that program was set up, it could be scheduled to archive her data automatically. It could have also been programmed to save phone contacts, photos, texts and other phone data. The emails released by the State Department included at least five messages from Abedin that were marked ‘Classified’ and were found on Weiner’s laptop. Huma Abedin backed up copies of her emails with Hillary Clinton to her pervert husband Anthony Weiner’s laptop, <a href=”http://DailyMail.com” rel=”nofollow”>DailyMail.com</a> can disclose – conflicting with her account to the FBI and in court that she did not preserve the conversations. The lengths to which the FBI relied on the Hillary Clinton opposition research dossier to investigate her political rival came into sharper focus with the testimony of the lead investigator, FBI agent Peter Strzok. Mr. Strzok told a joint House committee last week that the FBI received from Associate Attorney General Bruce Ohr a raft of documents — including sections of the anti-Trump dossier — during the investigation into Russia election interference. The first-time disclosure is significant because it confirms an unusual and continuing channel for collusion accusations that started outside the government with anti-Trump people and reached Mr. Ohrat the Justice Department and then the FBI. Around that time, Mr. Ohr was communicating with dossier writer Christopher Steele. Mr. Ohr’s wife, Nellie, a Russia researcher, worked for Mr. Steele’s paymaster, investigative firm Fusion GPS, which was trying to damage Republican presidential candidate Donald Trump. Mr. Ohr met with Fusion co-founder Glenn Simpson after the November 2016 election. Mr. Strzok, who led the FBI investigation of the Trump campaign, testified that he began receiving dossier sections in September 2016, but not from Mr. Ohr, and continued receiving documents into 2017. Mr. Strzok testified that he met with Mr. Ohr during that time. The arrangement suggests that the FBI used the partisan, anti-Trump dossier and was eager to receive its episodic chapters from June to December 2016. None of the Russia–Trump collusion charges has been publicly confirmed to date. Mr. Steele’s sources resided in the Kremlin. Mr. Steele, a former British spy who told Mr. Ohr he wanted to destroy the Trump candidacy, ultimately was paid by the Clinton campaign and the Democratic National Committee. Mr. Strzok’s text messages at the time revealed that he despised Mr. Trump and wanted, in his word, to “stop” him. He told the House Judiciary Committee and Oversight and Government Reform Committee task force that his FBI legal handlers placed tight controls on what he could disclose about his handling of the dossier. The agent testified that he couldn’t specify the “various places” where the FBI received dossier information or when he learned that Mrs. Clinton had funded it. But he did confirm: “I have been directed that I may state that I have read the dossier, that I read the dossier as it came in in parts and pieces to the FBI. “Mr. Ohr gave the FBI documents, which included material that I believe originated from Mr. Steele,” Mr. Strzok testified. Rep. Jim Jordan, Ohio Republican, had the job of trying to pry open dossier secrets from Mr. Strzok, a career counterintelligence agent. Mr. Jordan read from a Strzok email to colleagues. The email said Mr. Simpson and David Corn, a Mother Jones magazine writer who formed a close bond with Mr. Steele, also provided the FBI with dossier claims. Mr. Steele accused Mr. Trump of supporting an “extensive conspiracy” with the Kremlin to interfere in the presidential election. He made specific charges of collusion against Trump people that remain unconfirmed publicly two years later. At the end of Mr. Strzok’s testimony, Republicans gained a clearer picture of how the FBI acquired the Democrat-financed dossier that came to dominate the bureau’s investigation yet contained so many shaky charges. Republicans now know that the dossier trail started with Mr. Steele, Mr. Ohr, Fusion GPS and Mr. Simpson and a journalist. Mr. Corn has denied he worked with the FBI. Republicans knew beforehand that Sen. John McCain, Arizona Republican, hand-delivered a copy of the dossier to FBI Director James B. Comey in December 2016. BuzzFeed posted that copy on Jan. 17, 2017. “This is the first time to my knowledge that the FBI has admitted they got parts of the dossier from Bruce Ohr, a fellow DOJ employee. That’s scary,” Mr. Jordan said. According to separate House and Senate investigations, the FBI fired Mr. Steele around election time for violating its rules and going to Mother Jones with his story of a wide Trump-Russian conspiracy. Yet his research continued to reach the FBI via Mr. Ohr. The Justice Department demoted Mr. Ohr after these disclosures. Before the joint hearing, Republicans unearthed other findings on the FBI-dossier marriage. For example, the bureau cited Mr. Steele’s work to persuade a federal judge to approve wiretaps on Trump volunteer Carter Page from October 2016 to the following fall. Mr. Page, a pro-Russian energy investor, visited Moscow in July 2016 to deliver a public commencement address. Mr. Steele subsequently wrote that he met with two Kremlin figures sanctioned by the U.S. government. Mr. Steele said Mr. Page discussed bribes for sanctions relief. Mr. Page denied the charges under oath repeatedly and said he never met the two Kremlin figures. He has not been charged. Mr. Steele also wrote that Mr. Page and Paul Manafort, Mr. Trump’s former campaign manager, conspired with the Kremlin to interfere in the election. Mr. Page testified that he had never met nor spoken with Mr. Manafort. Committees also previously discovered that the FBI agreed to hire Mr. Steele, with an initial $50,000 payment, to continue investigating Mr. Trump. It would have meant the FBI was counting on a Democratic Party hired gun to investigate Mr. Trump during the transition and presidency. Justice Department Inspector General Michael E. Horowitz is investigating how the FBI decided to open its probe, seek surveillance warrants and hire at least one confidential human source to spy on some Trump people. mikenova shared this story from investigations of deutsche bank, oligarchs – Google News. Previous PostPrevious 6:13 PM 7/15/2018 – If the hackers “remotely configured an overseas computer to relay communications” in DNC hack, why wouldn’t they be able to do the same thing to Abedin’s Blackberry device?